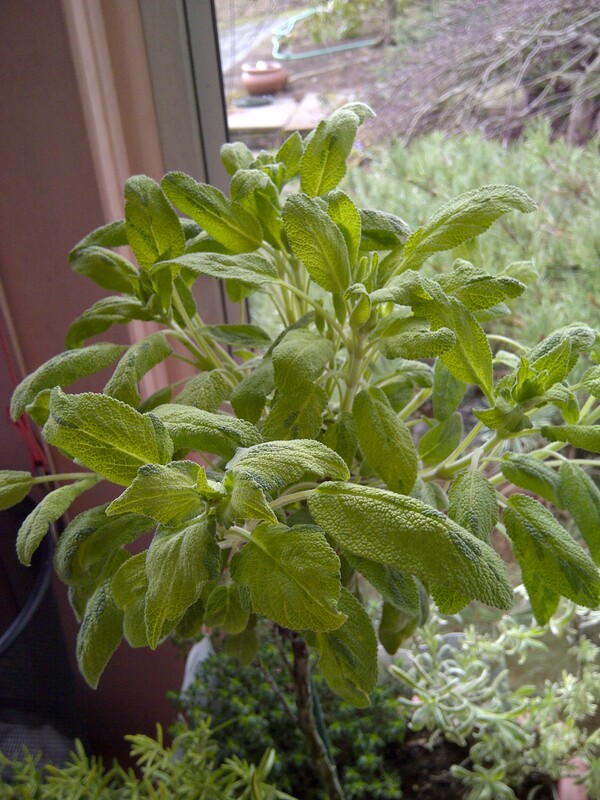 I grow a lot of sage (salvia officinalis and species) but I don’t really use it a lot in cooking. That may seem a little strange, but for me, sage is a beautiful, ornamental plant (it helps that I grow the variegated and purple leafed varieties). This is the golden sage topiary that was in that herbal planter that I showed in the post on thyme a few weeks back. The other reason that I like sage so much is that it blooms with a lovely blue bloom–and anyone who has grown the perennial salvia knows the lovely color and long bloom time of sage. Not only is this useful in the garden, but it’s great for attracting bees. And why do we need bees in the garden? To pollinate our vegetables, of course. And since many of my herbs are in with my vegetables, it’s very helpful to have sage as a plant to draw the bees to the garden. Sage, being in the mint family, will want full sun. It is better behaved than mint but a good sized plant can get a bit out of control in the garden after a few years. Luckily, a good pruning keeps it in bounds–it’s not like mint where you have to plant it in a pot to keep it from getting out of control and running amok! When I do use sage to cook, I use it for the very traditional bread stuffing around Thanksgiving. I have used it chopped finely and sauteed in a little butter with some cauliflower and I served that with some cheese ravioli. Other than that, I’m not much of one for cooking with it. But again, when a plant is so pretty and does such a wonderful job of bringing bees to the garden, what more do I need it to do? The fact that I can cook with it is almost an unexpected bonus! What a cool topiary! Do you bring more tender varieties indoors for the winter? I have been reading Tovah Martin’s The Unexpected Houseplant, and it has me thinking about all sorts of things that might be able to spend the winter indoors. I don’t usually bring them “all the way” indoors; instead, I winter them on my unheated sun porch. They seem to prefer it that way (particularly things like rosemary that like it a little cooler) and they’re still accessible for cooking. If you don’t have a sunny, unheated space, the coolest, sunniest window of you house is a great way to winter over tender herbs. Even basil will take it somewhat cool in the winter, so long as there’s a lot of sun. And of course the basil eventually has to come in from the sun porch.